A dedicated server ,also known as managed hosting service and it is a type of web hosting where the client leases the whole server and don’t shared it with anyone else. It is very much flexible than shared hosting, because companies have full control over the server(s), which includes choice of OS, any hardware and more. Another level of dedicated hosting which commonly referred to as complex managed hosting is present here. This complex managed hosting can be applied to both physical dedicated servers, Hybrid server and virtual servers, as many of the companies choosing a hybrid hosting solution. The provider steps in to take over most of the management, including security, memory, storage and IT support. →The dedicated server offers unlimited bandwidth and disk space, which enables us to have the full control over the information and media which are accessed, shared and stored on the web site. As its processor power, disk space, memory and many other resources are not shared with others, and it will not be slow down by traffic from other sites. 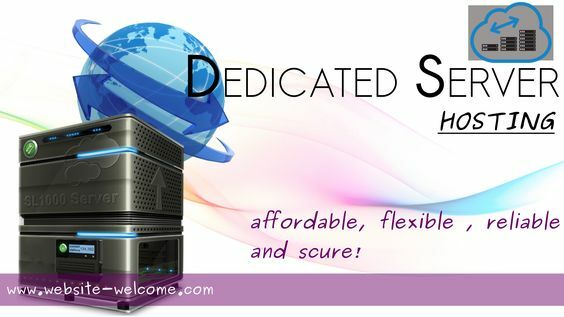 → If we want to give our visitors the best experience, then dedicated server may be the ideal option for us. It will allow visitors to log in and access all our site pages more easily & quickly. → One of the major disadvantages of using the dedicated server hosting is that it is very much expensive than other hosting servers. A dedicated server is fully dedicated to one or more web sites and owned by the same individual or the company, and it is more complicated than other one like of servers. → For establishing a dedicated server and manage a whole web site which is hosted on it, we need to have an extensive networking knowledge and good skills. Some of these things we need have to be familiar with which includes IP routing, server mechanisms, MX records and many more. If we know nothing about these skills, then we need to hire a dedicated server administrator or network administrator for managing our server. When this dedicated server crashes, it can be very difficult to fix, but it seldom crashes. This hosting is a suitable option if our website is drawing a lot of traffic or has to process a lot financial transactions very frequently.